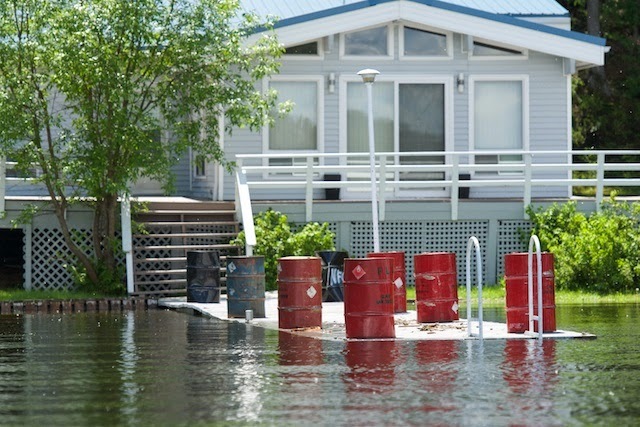 Once again (10 out of 11 years) Lake of the Woods water levels have risen significantly. This rise swamps out the low lying loon nest. Our nest is probably about 2 ft under water by now. So sad. There is a small chance the pair might try one more time but time is flying by. Hopefully the pair will stay together. 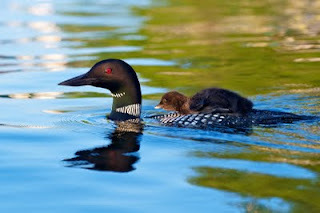 The accepted theory was that Loons mate for life. This is relatively true; unless they have trouble having young. It is at that point they might leave to find another partner. I'm not certain the 2 loons in our bay are the exact same 2 we met 12 years ago or not. 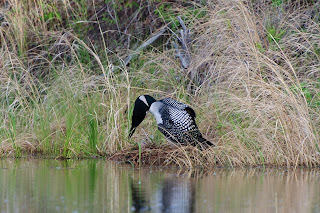 There was one year that there was only one loon in the bay (after 2 failed nesting attempts the previous year) so all bets are off. I'm including a shot of the neighbour's dock. The top of the dock is usually about a meter above "normal" lake levels. The cans on top of the dock are full of water and are trying desperately to hold the top of the dock in place, above the cribs below. Okay, let's try this again! 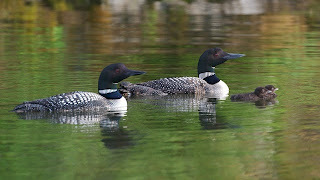 My loon pair trying to have young again! Two weeks ago there was just some casual dating happening in our bay. 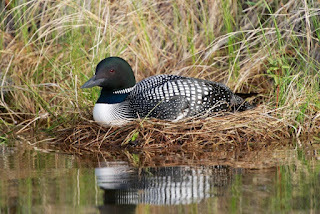 This last weekend was a great surprise as we see there is a nest with the loons (they take turns) sitting on the eggs! I pedal boated reasonably close and grabbed some photographs of the happy parent(s). Funny thing is that they'll leave the nest for hours on end and then sit on them for hours on end. I guess they know what they're doing. 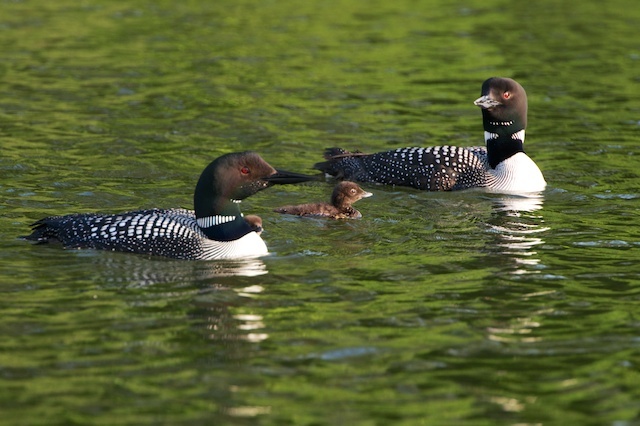 30 days is the average incubation period, so if all goes well, there might be some baby loons in our bay come the end of June! I won't get my hopes up as the Lake of the Woods water level has been steadily rising and only a few inches more will swamp the nest. The nests are pretty primitive. The loons basically sit and then drag mud and sticks from around them, into the nest. 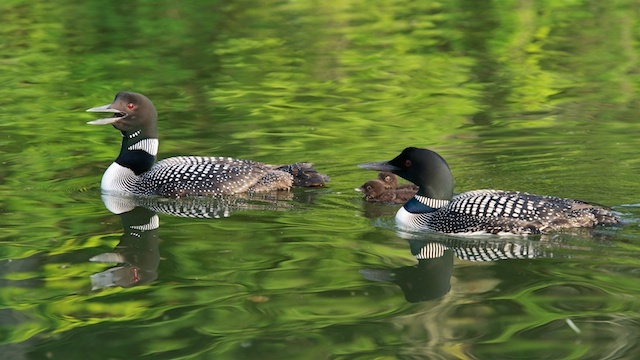 For those unfamiliar with loons, they have to nest right by the water as they cannot walk on land. 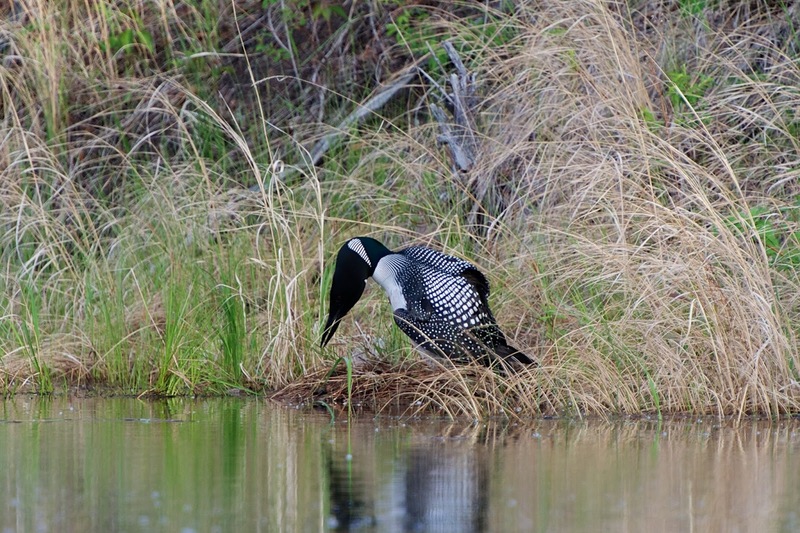 They drag themselves onto the make-shift nest and drag themselves back into the lake to feed. They're back legs are too far placed in their body to walk on land. 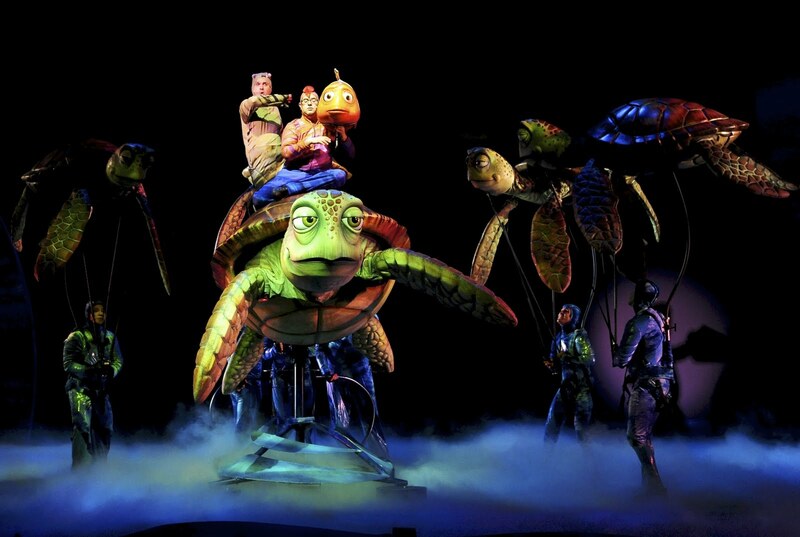 This unique feature, however, makes them incredible swimmers! Stay tuned! Next post will be in two weeks when we return, hopefully to see them still nesting. More photographs of the 2014 Loon talent show are on my website. 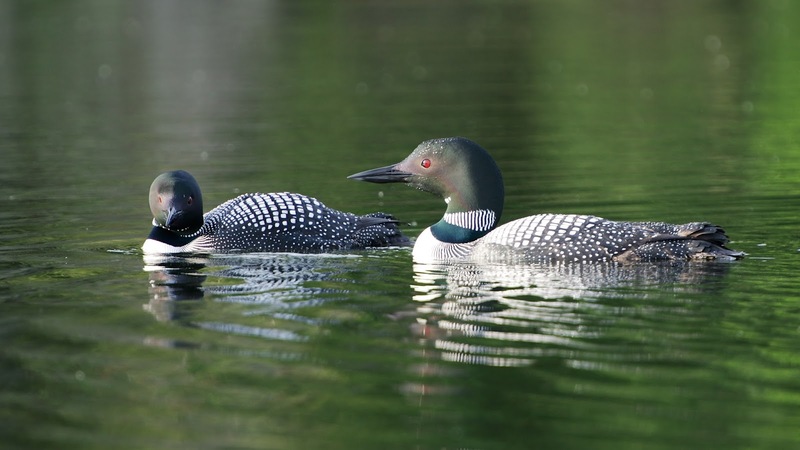 Thankfully the pair of loons in our bay seem to be staying together, even after having 2 nests fail this spring. 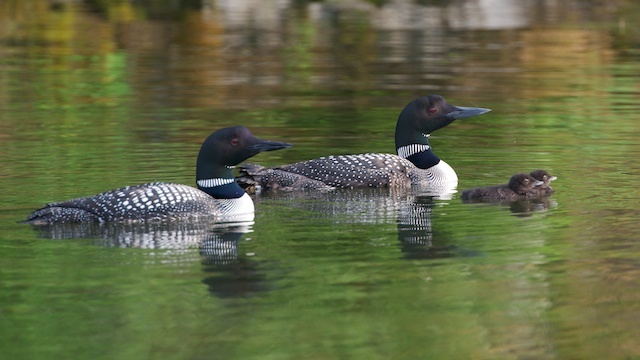 From what I've researched, loons typically stay together for life unless one dies or they have trouble having offspring. Two Springs ago, when a similar swamping of nests occurred in our bay, there was only one loon swimming about all summer. I'm encouraged there are still two hanging out thus far this year! 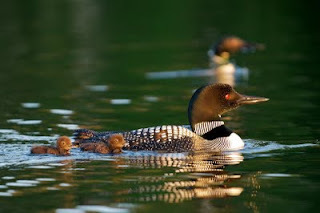 I do have some new loon pictures with babies though! 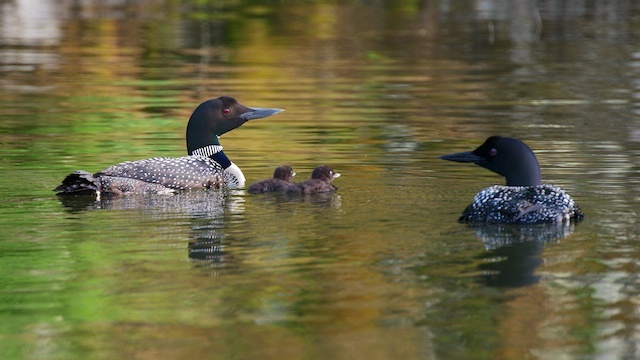 A neighbor dropped a hint that there was a family of loons about 5 km away in a small inlet in Clearwater Bay. That evening I jumped on our Sea Doo and checked it out. Well, there they were. 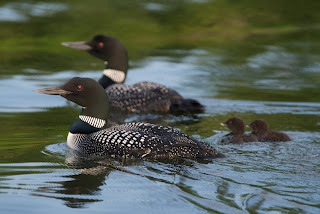 However, they certainly behaved like a normal loon family; darting about, calling out when I came anywhere near. (like 300 meters). The problem with the Sea Doo is that it is very hard to keep in one spot. A pedal boat is much better and makes less noise. 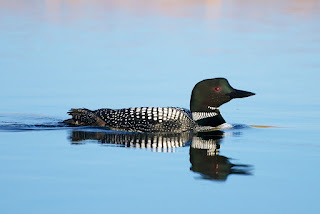 I was determined to somehow get some shots so spent about 1.5 hours slowly moving back and forth, getting closer and closer to the loons. My plan, which seemed to work, was to acclimatize them to me and the boat and by the time 1.5 hours went by, I was able to get near enough to snap a few photos. The young didn't ride on the parent's backs at all, and seemed bigger than the little ones I photographed years ago. One of the young was even able to duck under water and swim for a while before popping up about 10 meters away! 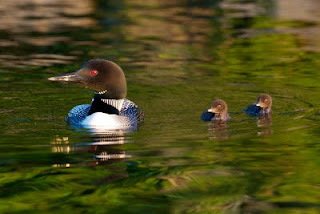 I sure miss the moments photographing the family in our bay; they were very trusting and even fed their young while I sat in my pedal boat, just meters away. 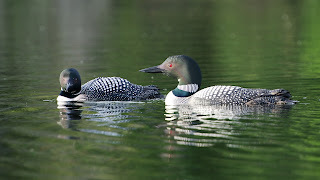 I am still thankful I was able to get a few quality pictures to add to my Loon collection. Well, another year, another failure. 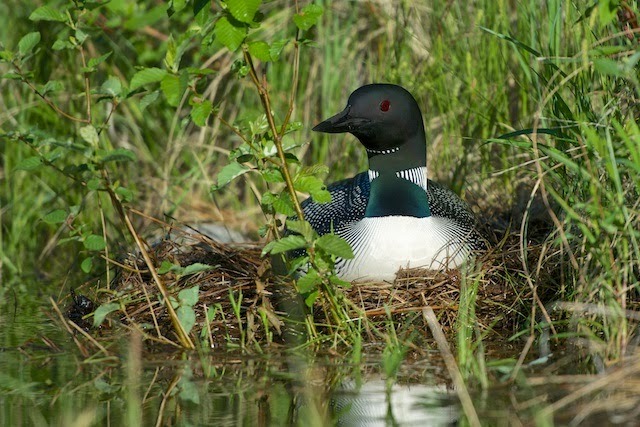 just heard from the neighbour at the lake that the loons abandoned the nest yesterday. It then rained like crazy and they can't even see the nest any more. There is a slim chance they might start a 3rd nest, but it's very rare. I think we're done again. They made it to day 20; only 9 more to go and then failure. So sad. Might try blogging again next year! 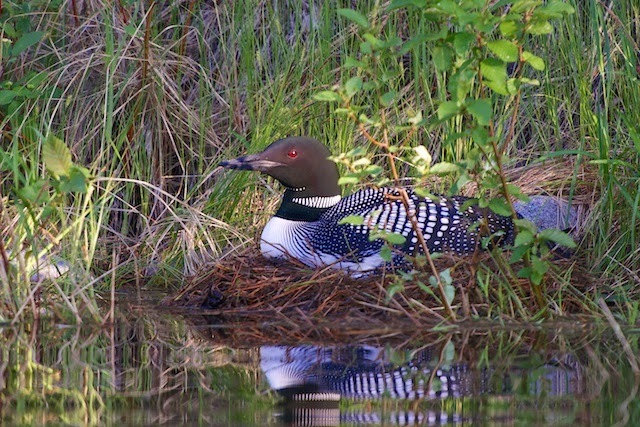 This is the second nest this pair of loons have attempted this spring. The first was washed out by the rising Lake of the Woods levels over the past few weeks. 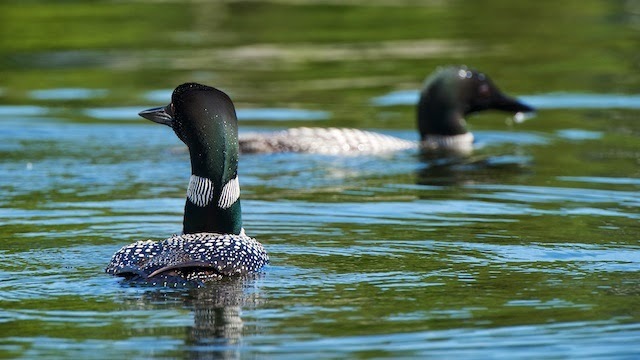 The Lake is controlled by an outlet to the Winnipeg River System (which eventually empties into Lake Winnipeg) and it seems like they haven't quite got a hold of how much water to let out or hold... One would think that loons aren't so smart as they seemingly should build their nests higher up the land. 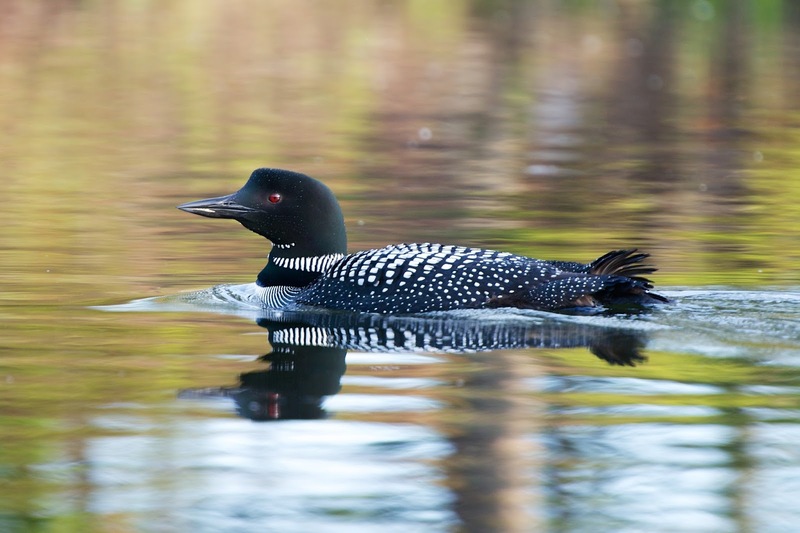 The problem with loons is that they need to nest right next to the water as they are unable to walk on land. Their back legs are situated so far back in their bodies that walking is impossible. They actually drag themselves up on the nest with their wings! This design, however, allows them to swim like a fish. 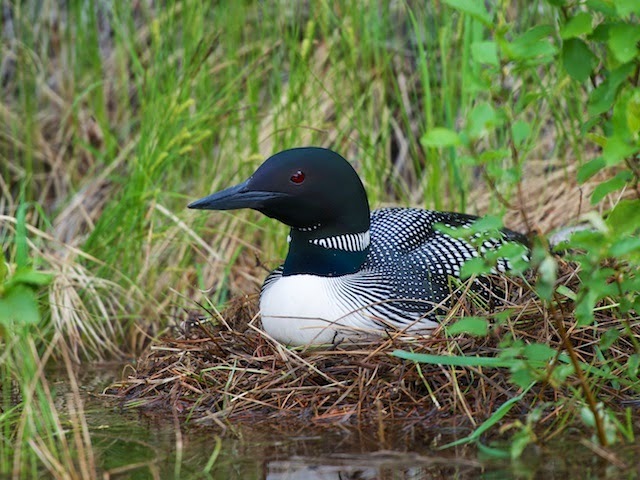 This second nest and its 2 eggs were set up on June 1st and it takes about 29-30 days for the eggs to incubate. 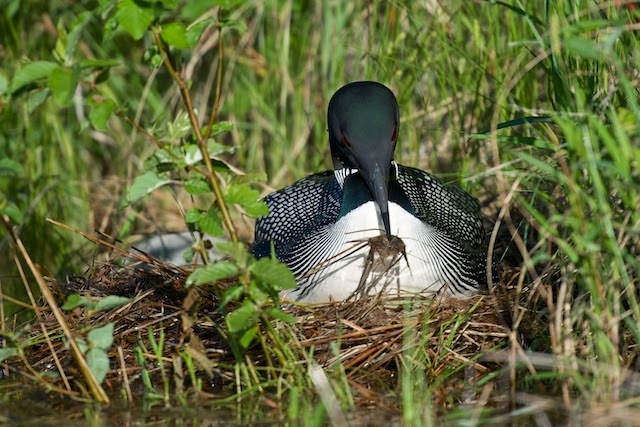 As long as the water doesn't rise, the eggs don't get wet, the local eagles don't eat the eggs (The loons leave the nest up to an hour at a time), I might have 2 baby loons to photograph right in the beginning of July! Hope to be out at the lake next weekend (June 23rd) to update the blog. 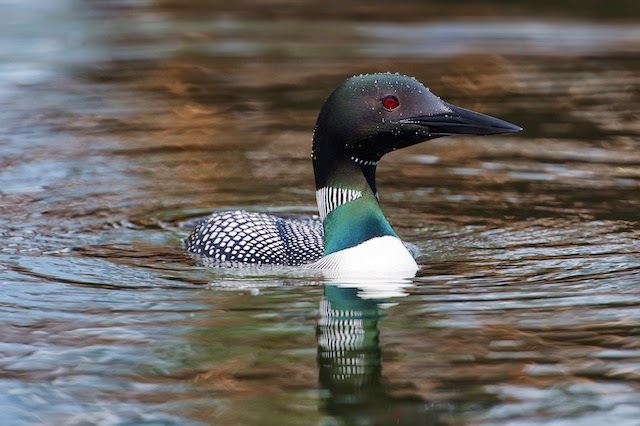 The loon guy is back in business! 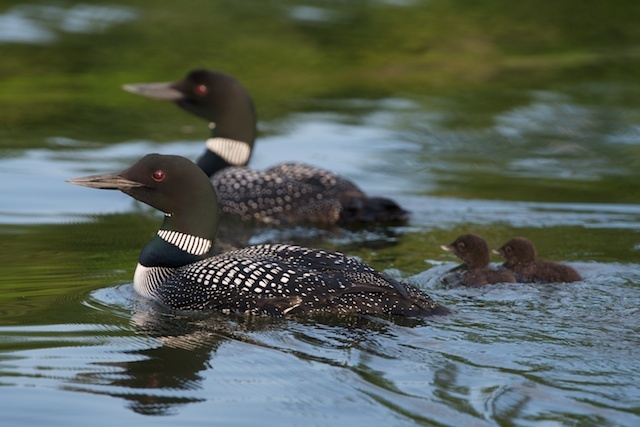 By complete accident, while boating close to my father's cabin in Lake of the Woods, we found a new loon family with two young! The pair that tried 2x unsucessfully to reproduce last year because of flooding of their nest, never showed up this year. 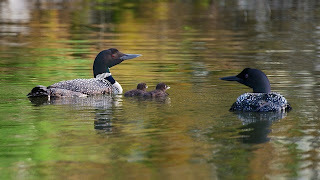 So finding another family, though much tougher to photograph than our friendly loons in our bay, was a great surprise. 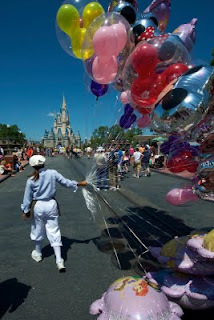 Check out more shots on my webpage! Had a great time with Sheri's side of the family in Disney at the end of March. 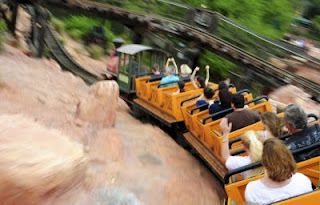 Was in a Disney park every day but one. Unfortunately we had two days that just poured buckets; made national weather news because of the amount and longevity of the rain. Didn't seem much like Florida those days! Actually, on a day where we dropped off our kids at Universal Theme Park, Sheri and I went back to Disney and went on all the "lame" rides that people don't generally go on. 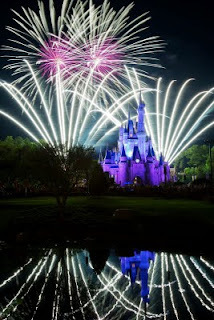 Had a blast and no lineups! 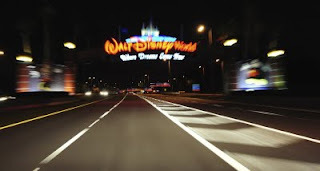 Carousel of Progress, The Hall of Presidents, Country Bear Jamboree etc. See a wack more shots on my webpage.